Cryonics patients are stored in liquid nitrogen either in cryostats (Cryonics Institute) or dewars (Alcor). Cryostats and dewars are like big thermos bottles, with liquid nitrogen in the middle rather than coffee. Because cryostats and dewars are like thermos bottles, they are not dependent upon electricity. When there is a blackout or power failure the cryonics patients remain at liquid nitrogen temperature. As of early 2009 the Cryonics Institute had thirteen cryostats in service for storage of cryonics patients in liquid nitrogen. Three rectangular and ten cylindrical. Cryogenic (a word often confused with "cryonic") refers to temperatures less than −100ºC (−150ºF). Liquid nitrogen temperature is −196ºC ( −321ºF). We call our custom-made fiberglass HSSVs (Hard-Shell, Soft-Vacuum) units cryostats to distinguish them from the HSHVs (Hard-Shell, Hard-Vacuum) steel dewars manufactured by companies such as Minnesota Valley Engineering (MVE, acquired by Chart Denver in 1999). Dewars have a very high vacuum ("hard vacuum") in a two-inch space between steel walls. A vacuum prevents heat transfer by conduction and convection, but radiation can only be reduced by the use of radiation barriers made of aluminum or aluminized mylar film. 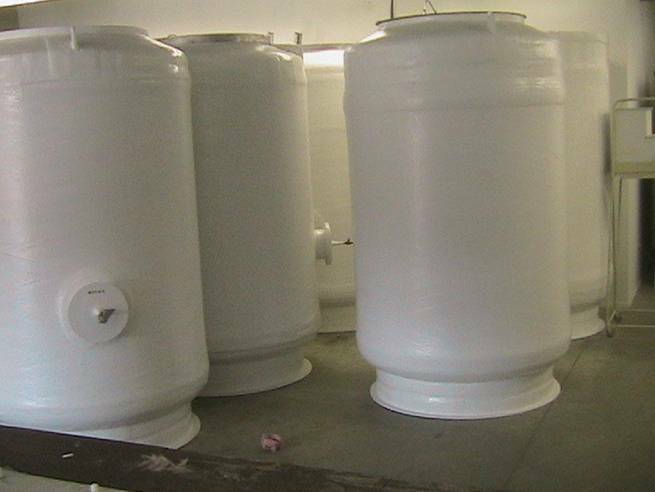 Our cryostats have inner and outer walls made of fiberglass-resin composite that is very much stronger than either fiberglass or resin would be alone. I have been told by a cryogenics fabrication company salesman/engineer that steel dewars cannot possibly compete with fiberglass for efficiency, and that steel dewars the size of our cryostats would have about twice the liquid nitrogen boil-off. The distance between the inner and outer walls of our cryostats is about a foot for the entire circumference of a cylindrical cryostat (or perimeter of a rectangular cryostat). Within that foot of space is perlite insulation packed loosely enough that a soft vacuum can be applied. There is no detectable difference between room temperature and the outer walls of the cryostats, but the cryostat lids are about 2ºC to 3ºC lower temperature than room temperature. Perlite is a non-corrosive, non-combustible, naturally-occurring volcanic glass that can be used as an inexpensive insulator. Perlite ore is a silicon-dioxide-rich volcanic glass containing 2 to 5 percent water. When rapidly heated above 870ºC (1600ºF) the rapid vaporization of the water makes the rock pop like popcorn to form countless tiny bubbles that expand the volume up to 20 times — reducing the density and thermal conductivity by a like amount. The resulting thermal conductivity for perlite at low temperature and pressure and is about 0.0007 Watts per meter-Kelvin — roughly one-thousandth the thermal conductivity of water or brick and about one-fortieth the thermal conductivity of extruded polystyrene foam boards, such as Styrofoam® or Foamular®. Unlike extruded polystyrene, however, which is chemically hydrophobic and impervious to moisture because of closed cells, the expanded perlite has open cells which can be infiltrated with moisture. Moisture must be maintained below 0.1 percent by weight or the insulating capability is degraded — due to the much higher thermal conductivity of water. The Cryonics Institute obtains its perlite from Grefco Minerals, Inc (HP 500 grade). Vacuum is measured in units of air pressure — similar to mm Hg (millimeters of mercury) used for blood pressure, but orders of magnitude lower — zero microns Hg for a perfect vacuum. Some people use the term hard vacuum to refer to a pressure of one-third or less of atmospheric pressure (atmospheric pressure is 760 mm Hg), whereas soft vacuum is any pressure less than atmospheric, but greater than hard-vacuum. Others (including cryonicists) restrict the term "hard vacuum" to pressures of a few microns or less, and "soft vacuum" to pressures greater than hard vacuum, but up-to but not greater-than a few orders of magnitude higher. A strong vacuum-pump creates the hard vacuum for a dewar at the time of manufacture — a vacuum intended to last for 10 years. The vacuum is reinforced by getters, chemically-reactive metals (usually barium, zirconium or their alloys) which react with oxygen, nitrogen, carbon dioxide and water vapor to further harden the vacuum and keep it hard. The vacuums in our soft-vacuum cryostats are reinforced by our Welsh-Sargent DuoSeal Pumps every two months. 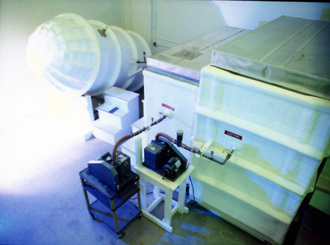 The perlite insulation of the cryostats provides a backup for the soft vacuum. An armor-piercing bullet from a high-powered rifle could travel through the entire diameter of a cryostat or dewar. But a pistol bullet or forklift puncture would likely only put a hole in the outer wall of a cryostat. For a dewar, such a puncture would be an emergency demanding immediate removal of the patients. Even a dent can create a "hotspot" in a dewar. (A "hotspot" is paradoxically noticeable as a frosty-spot on the outside — corresponding to a warm-spot on the inner wall of the dewar). But the loss of vacuum in a cryostat might not be much of a problem because of the perlite insulation. There would be plenty of time to patch the fiberglass and restore the vacuum. Although we have some patients who are quite tall and/or obese, we have not yet experienced any problem fitting six patients into one of our cylinders. There would be even less problem in the rectangular units where the patients lay flat and are simply stacked on top of each other 3 or 4 layers deep (the patients are in sleeping bags and are very buoyant in liquid nitrogen, so there is no crushing weight or injury). In the cylinders the most crowding occurs in the area of the chest, with general narrowing toward the feet (partly due to the variation of abdomen and hip girth for men and women). There is plenty of leg-room. The cylinders are filled weekly, whereas the rectangular units are filled twice weekly. The depth of liquid nitrogen ranges from 7.5 feet at the lowest to about 8 feet just after a refill. The level of liquid nitrogen in the most efficient cylinders drops only a bit more than 2 inches in a week. So in the cylinders our tallest patients, at about six-and-a-half feet have at least a foot of liquid nitrogen above their toes at all times. Should a disaster occur — which has not happened since we began service in 1976 — the feet would be the first to suffer exposure and the head the last. The first cryostat built was designated HSSV−1, signifying that it is a Hard-Shell Soft-Vacuum unit holding one whole body patient. Hard-Shell means that the shell is hard enough to maintain shape when a vacuum is applied (ie, the walls do not collapse due to external or internal pressure). The HSSV−1 was taken out of service in the mid-1990s, around the time when CI moved to its current building in Clinton Township, Michigan. But the HSSV−2 (holding two whole body patients) remained in service a decade longer. HSSV−2 looked like a big gelatin capsule propped-up at a 20-degree angle (or looked like a spaceship ready for launch). HSSV−2 was tilted so that the patients' heads can be down, but it couldn't be built to be vertical because the ceiling of the old building wasn't high enough. The HSSV−2 was removed from service in December, 2004 — with the two patients it contained moved to one of our new HSSV−6 cryostats. CI has three rectangular cryostats, designated HSSV−R7, HSSV−R10 and HSSV−R14, which hold 7, 10 and 14 whole-body patients respectively. HSSV−R7 is actually soft-shelled rather than hard-shelled because it only maintains its shape under vacuum due to wooden supports between the walls. Like HSSV−2, all of the rectangular units were built by CI facilities manager Andy Zawacki using epoxy fiberglass for the inner walls, polyester fiberglass for the outer walls and wood for structural support. The HSSV−R10 and HSSV−R14 were built in such a way as to avoid the use of wood between the walls — because wood conducts heat. The HSSV−R14 unit ("the largest cryostat in the world") took Andy two years to build. He was too busy with the pressures and projects of running the CI facility and he was having problems with rashes from the epoxy fiberglass which is needed to hold the liquid nitrogen. So it was decided that it would be necessary to contract with a manufacturer to build fiberglass cryostats. Robert Ettinger favored an upright cylindrical design for units that would hold up to six patients. The first upright cylindrical unit, the HSSV−6−1, had structural defects. First Andy found a hole which he had to plug in order for the unit to hold a vacuum. When he put liquid nitrogen into the unit, it cracked — forcing him to reline the inside with fiberglass. The thick top conducts too much heat. Another manufacturer had to be found. The second manufacturer uses a type of fiberglass resin which is the same as one they use for liquid nitrogen testing of cruise missiles. They gave CI good warranties on the quality of their work, which has been (for the most part) very good. Prior to getting the bulk liquid nitrogen tank we were paying 50 cents per liter for liquid nitrogen. But with the bulk tank, which holds 3000 gallons (11,000 liters), we are only paying about 13 cents per liter (just over 50 cents per gallon). 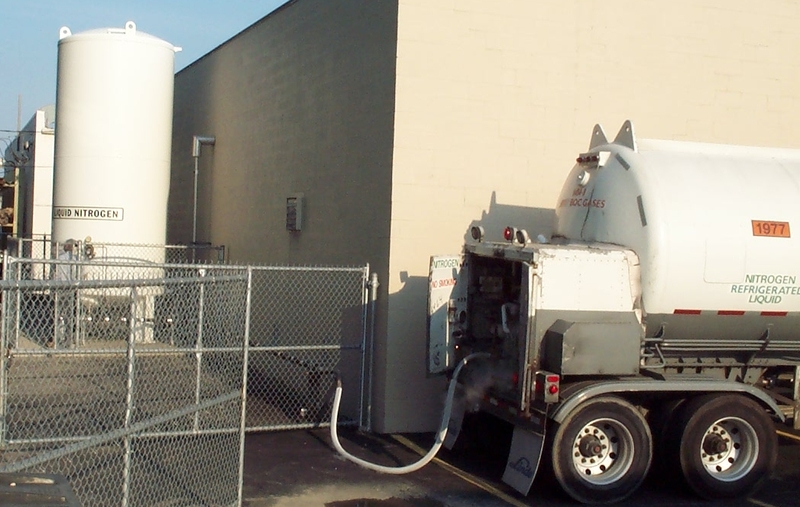 A liquid nitrogen delivery truck that looks like a gasoline tank truck fills the bulk tank with 2000 gallons approximately once every two weeks. A guage on the tank reads liquid nitrogen levels in inches and centimeters. A fill of 2100 gallons would raise the reading from about 40 inches to about 130 inches — or about 105 centimeters to about 325 centimeters. It takes just over half an hour to load the liquid nitrogen into the tank. From the bulk tank the cryostats are filled with liquid nitrogen through insulated pipes and hoses. Twice each week the rectangular cryostats are topped-off, and all cryostats are topped-off once per week. Topping-off the rectangular cryostats results in a 20 cm drop in the level of the bulk tank, whereas topping-off all cryostats results in a 65 cm drop. 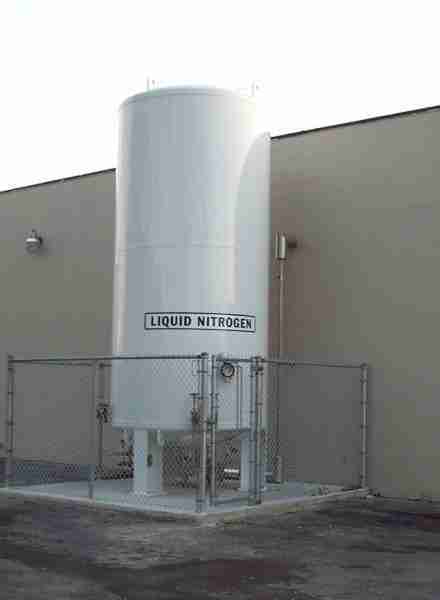 At 36 liters per centimeter (cm) the partial fill requires 720 liters and the full fill requires 2340 liters of liquid nitrogen. The bulk tank has pressure relief valves of 175 PSI (Pounds per Square Inch) and the line from the bulk tank into the building has a pressure relief valve of 150 PSI (all other lines have 400 PSI relief valves). Pressure increases with time in the bulk tank, but with two fillings per week, bulk tank pressure is generally below 100 PSI. Just before a filling, a valve on the bulk tank will be opened to release gas to drop pressure below 50 PSI. The inefficiency of HSSV−6−10 and the relative inefficiency of HSSV−6−9 can be explained by the fact that they have had temporary lids while storing patients. HSSV−R10 requires a vacuum pump running about 16 hours per day for at least 3 days every two months, during which time the soft vacuum drops from nearly 200 microns Hg to under 20 microns Hg. HSSV−R14 is more efficient than HSSV−R10, with highs of 20 microns Hg and lows of about 1 or 2 microns Hg after 2 or 3 (16-hour) days of vacuum pumping. HSSV−R7 does the best job of holding a vacuum of any of the rectangular cryostats, with highs not over 12 microns Hg and only one or two days of pumping required every two months. For the HSSV−6 cylindrical cryostats we typically pump vacuum for one or two 16-hour days every two months. There does not seem to be much variation in liquid nitrogen boil-off for any pressure ("partial vacuum") under 100 microns Hg. The following table shows the maximum pressures measured each two months before vacuum pumping, and the maximum days required to pump the cryostat to a reasonably low pressure (well below 10 microns Hg and generally very close to 1 microns Hg). HSSV−6−1 is less efficient because the inner wall is supported to the outer wall with bracing and thicker contracts (which conduct more heat) — in contrast to the other cryostats for which the inner wall is only connected to the outer wall by a circle at the top. HSSV−6−2 is less efficient because it was not as fully packed with perlite. 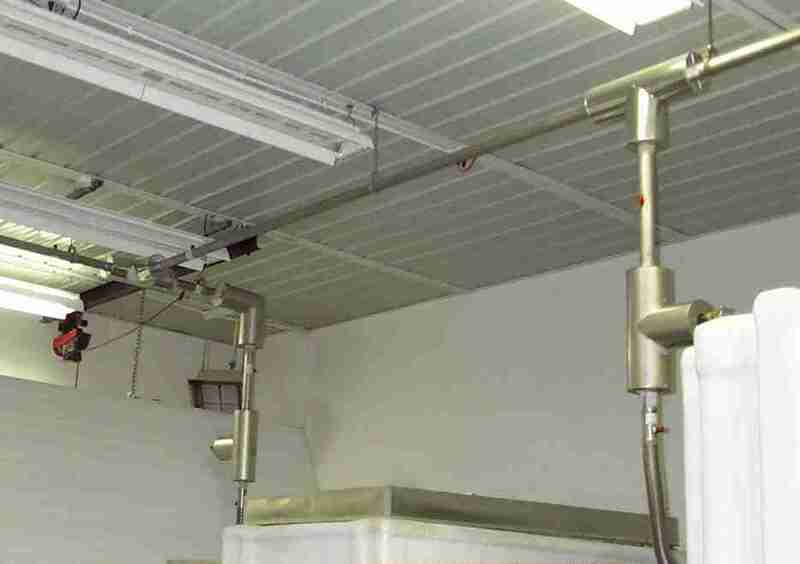 Over time the maximum pressure and the amount of pumping required for a cryostat tends to decline because of "out-gassing" of water and other volatiles from the perlite and fiberglass walls. When we receive a new cryostat from the manufacturer there is a fair amount of more work that must be done at CI before the cryostat can be put into service, including topping-off the perlite, making a bottom and preparing a filter. The preparation process is documented in detail in the WORD document Cryostat Preparation. To test that the new cryostats have no cracks, we first fill the bottom six inches with liquid nitrogen and let it sit overnight. If there has been no vacuum loss by the next morning the cryostat will be filled over a ten hour period — about 20 cm per hour. This is known to be a safe rate. We have not pushed the limits to discover an unsafe rate guaranteed to cause cracking. If there is a loss in vacuum during the filling the liquid nitrogen is removed and the inner walls are carefully examined for cracks that must be patched with fiberglass/vinyl ester resin. In most cases the cryostat can be filled with the full seven feet without the occurrence of cracks (vacuum loss). The HSSV−6 cylindrical cryostats are coated with a fire retardant known as Fire-Free 88, which we selected after exhaustive research into the market for retardants. Facilities Manager Andy Zawacki demonstrated that three coats of FF88 could withstand a full minute of the hottest portion of a blowtorch without penetration. The closest contender was Contego. The older (rectangular) cryostats were constructed with 10% antimony trioxide fire retardant incorporated into the fiberglass-resin composite. All cryostats are made from fiberglass/resin composite material. The outer walls of the rectangular cryostats are made of a composite of fiberglass & polyester resin, whereas the inner walls are made of fiberglass & epoxy resin composite. The cylindrical cryostats use fiberglass & vinyl ester resin for both inside and outside walls. In all cases fiberglass is saturated with a syrupy resin mixture under conditions in which the resin monomers polymerize ("cure") — hardening to form a very strong, durable and corrosion-resistant composite. Polyester and vinyl ester resins are cured using a catalyst which is not incorporated into the structure, whereas for epoxy resins the hardener is incorporated into the final cross-linked network. An epoxide is a cyclic ether in which an oxygen atom is joined to two carbon atoms. Epoxy resin monomers are typically large aromatic-containing hydrocarbon molecules having epoxides ("epoxy groups") at each end. The hardener is typically a diamine that causes nitrogens to bind to the terminal carbon of the epoxy group, displacing the oxygen, which accepts a hydrogen to becomes an alcohol group. The epoxy resin used by CI was modified diglycidyl ether of bisphenol A, and the hardener was modified aliphatic amine (triethylenetetramaine), both from Tool Chemical Co, Inc..
Polyester resin is inexpensive and easy to use — it combines readily with fiberglass.The polyester resin we used was 40-50% styrene (Tool Chemical TCC-072). Epoxy resin is the most expensive, but it has the best thermal properties. Unfortunately, epoxy resin is the most difficult to work with. When applying resin-saturated fiberglass mats too rapidly all the resins can produce too much heat during the curing — resulting in bubbling, smoking & cracking. When applied too slowly the layers don't adhere well enough to remove air pockets. Vinyl ester resin is easier to work with than epoxy, is less expensive and has better corrosion resistance. Like polyester resins, vinyl ester resins shrink about twice as much as epoxy resins upon curing, which can lead to internal cracks if care is not taken to prevent them. CI's cylindrical cryostats contain a modified vinyl ester — Hetron 922 (Ashland Chemical) — which toughens the monomer with carboxyl-terminated butadiene-acrylonitrile copolymer. As with polyester resin, the curing catalyst used is methyl ethyl ketone peroxide (2-butanone peroxide), which initiates a free-radical type of chain reaction that does not incorporate the catalyst into the final network. Five milliliters of MEK peroxide is used per pound of Hetron 922. It is doubtful that modification of the resin will make much difference in the thermal properties of CI's cylindrical cryostats, which currently have a liquid nitrogen boiloff of less than $100 per patient per year. There may be some room for improvement on vacuum maintenance, however. The difference between 50 microns of pressure and a complete vacuum in the cryostats makes no noticeable difference to boil-off. But when the pressure in the walls rises to 100 microns of mercury, boiloff increases noticeably. It takes about three weeks without running a vacuum pump for the pressure to rise to 100 microns. The two likely reasons why the pressure could rise are outgassing from the resin and leakage from the valves. To deal with the former possibility we are considering the idea of heating the cryostat shortly after delivery to exhaust the outgassing capabilities of the resin. Concerning the latter, we are currently using water valves rather than vacuum valves because the only vacuum valves Andy has seen were too small for our purposes. I intend to look more vigorously. Potentially we could improve performance to the point that we would only need to run a pump every few months — or even years.